Published Feb. 2, 2018 at 10:31 a.m. 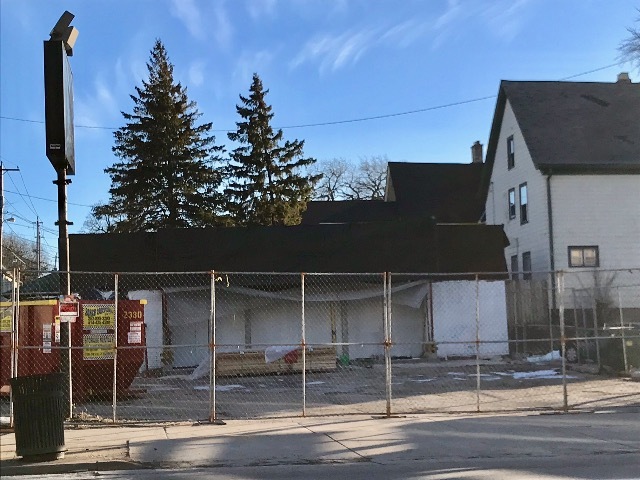 The former Open Pantry store at 1515 E. North Ave., near Cambridge, is currently being renovated and will house the first Wisconsin location of D.P. Dough calzones. The eatery is expected to open in late spring. The Columbus, Ohio-based chain, founded in Massachusetts in 1987, has more than 25 locations in 17 states – typically choosing college towns – and stays open until 3 a.m. to cater to the post-bar-time and late-night-test-cramming crowds. The Milwaukee franchise – owned by husband and wife, Mike and Georgina Styke – is directly across the street from Cambridge Commons – UW-Milwaukee housing – and across the viaduct from RiverView Residence Hall, another UWM dorm building. D.P. Dough makes a wide variety of calzones, including many unexpected tastes, like cheeseburger; pineapple, ham and mozzarella; and barbecued chicken. The menu also offers the option to make your own with up to four ingredients. Did I mention that the shop also delivers? The 2,500-square foot former Open Pantry has been a boarded-up eyesore for about six years now and it'll be nice not only to see it open again, but churning out what will surely be the great scent of calzones.